Through the early years of the 1970s, WDC made their money by selling calculator chips; by 1975, they were the largest independent calculator chip maker in the world. The oil crisis of the mid-1970s and the bankruptcy of its biggest calculator customer, Bowmar Instrument, changed its fortunes, however. In 1976, Western Digital declared Chapter 11 bankruptcy. After this, Emerson withdrew their support of the company, and WDC was on its own. WDC introduced several landmark products during this time, including the MCP-1600 multi-chip, microcoded CPU. The MCP-1600 was used to implement DEC's LSI-11 system and their own Pascal MicroEngine microcomputer which ran the UCSD p-System Version III and UCSD Pascal. The processor was also used in several single-chip floppy disk drive controller chips, notably the FD1771. The WD1771 and its kin were WDC's first entry into the data storage industry; by the early 1980s, they were making hard disk drive controllers, and in 1983, they won the contract to provide IBM with controllers for the PC/AT. That controller, the WD1003, became the basis of the ATA interface (which WDC developed along with Compaq and Control Data Corporation's MPI division, now owned by Seagate Technology), starting in 1986. Throughout most of the 1980s, the family of controllers based on the WD1003 provided the bulk of WDC's revenues and profits, and for a time generated enormous corporate growth. Western Digital Paradise VGA card, 8-bit ISA bus, circa 1989Much of the mid-to-late 1980s saw an effort by WDC to use the profits from their ATA storage controllers to become a general-purpose OEM hardware supplier for the PC industry. As a result, WDC purchased a number of hardware companies. These included graphics cards (through their Paradise subsidiary, purchased 1986), core logic chipsets (by purchasing Faraday Electronics Inc. in 1987), SCSI controller chips for disk and tape devices (by purchasing ADSI in 1986), networking (WD8003, WD8013 Ethernet and WD8003S StarLAN). They did well (especially Paradise, which produced one of the best VGA cards of the era), but storage-related chips and disk controllers were their biggest money makers. In 1986, they introduced the WD33C93 single-chip SCSI interface, which was used in the first 16-bit bus mastering SCSI host adapter, the WD7000 "FASST"; in 1987 they introduced the WD37C65, a single-chip implementation of the PC/AT's floppy disk controller circuitry, and the grandfather of modern super I/O chips; in 1988 they introduced the WD42C22 "Vanilla", the first single-chip ATA hard disk controller. 1988 also brought what would be the biggest change in WDC's history. That year, WDC bought the hard drive production assets of PC hardware maker Tandon; the first products of that union under WDC's own name were the "Centaur" series of ATA and XT attachment drives. Western Digital Caviar280 (WDAC280-32) - 85.3 MB (mounted on a third party 5.25" bay adapter bracket)By 1991, things were starting to slow down, as the PC industry moved from ST-506 and ESDI drives to ATA and SCSI, and thus were buying fewer hard disk controller boards. That year saw the rise of WDC's Caviar drives, brand new designs that used the latest in embedded servo and computerized diagnostic systems. Eventually, Caviar drives were selling so well that WD started to dispose of its other divisions. Paradise was sold to Philips (and has since disappeared); their networking and floppy drive controller divisions went to SMC Networks; and their SCSI chip business went to market leader Adaptec. Around 1995 the technological lead that the Caviar drives had enjoyed was eclipsed by newer offerings from other companies, especially Quantum Corp., and WDC fell into a slump. Products and ideas of this time didn't go far; the Portfolio drive (a 3-inch (76 mm) form factor model, developed with JT Storage) was a flop, as was the SDX hard disk to CD-ROM interface. WDC's drives started to slip further behind products by other makers, and quality began to suffer; system builders and PC enthusiasts who used to recommend WD above all else were going to the competition, particularly Maxtor, whose products had improved significantly by the late 1990s. In an attempt to turn the tide in 1998, WD recruited the help of IBM. This agreement gave WD the rights to use certain IBM technologies, including giant magneto-resistive (GMR) heads, and access to IBM production facilities. The result was the Expert line of drives, introduced in early 1999. The idea worked, and WD regained much respect in the press and among users, even despite a recall in 2000 (which was due to bad motor driver chips). WDC has since broken ties to IBM. 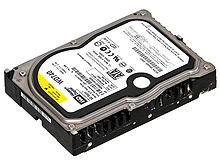 Western Digital WD740GD Raptor - 10,000 rpm - 74 GBIn 2001, Western Digital became the first manufacturer to offer mainstream ATA hard disk drives with 8 MB (8 MiB) of cache, or disk buffer. At that time most desktop hard disk drives had 2 MB of buffer. WDC labeled these 8 MB models as "Special Edition" and distinguished them with the JB code (the 2 MB models had the BB code). The first 8 MB cache drive was the 100 GB WD1000JB; models with capacities from 40 GB to 250 GB and more followed. WD advertised the JB models as a good choice for cost-effective file servers. In 2003, WD acquired most of the assets of bankrupt one-time market leading magnetic hard drive read-write head developer Read-Rite Corporation. In the same year, WD offered the first 10,000 rpm Serial ATA HDD: The WD360GD "Raptor" with a capacity of 36 GB and an average access time of less than 6 milliseconds. Soon, the 74 GB WD740GD, which is also much quieter, followed and in 2005 Western Digital released the 150 GB version, the WD1500. As of 2004 the WD Raptor drives have 5 years of warranty, making them a more attractive choice for inexpensive storage servers, where a large number of drives in constant use increases the likelihood of a drive failure. In 2006, Western Digital introduced its My Book line of mass market external hard drives that feature a compact book-like design. On the 7th October 2007 Western Digital released several editions of a single 1 TB hard drive - the largest in its My Book line. In 2007, Western Digital acquired magnetic media maker Komag. Also in the same year, Western Digital adopted perpendicular recording technology in its line of notebook and desktop drives. This allowed it to produce notebook and desktop drives in the largest classes of the time. Western Digital also started to produce the energy efficient GP (Green Power) range of drives notable for their very low power consumption and heat dissipation but surprisingly good performance. In 2007 Western Digital announced the WD GP drive touting rotational speed "between 7200 and 5400 rpm", which, if potentially misleading, is technically correct; the drive spins at 5405 rpm, and the Green Power spin speed is not variable. On April 21, 2008, Western Digital announced the next generation of its 10,000 rpm SATA WD Raptor series of hard drives. The new drives, called WD VelociRaptor, feature 300 GB capacity and 2.5-inch (64 mm) platters enclosed in the IcePack, a 3.5-inch (89 mm) mounting frame with a built-in heat sink. Western Digital claims the new drives are 35 percent faster than the previous generation WD Raptors. On September 12, 2008, Western Digital shipped a 500 GB 2.5-inch (64 mm) notebook hard drive which is part of their Scorpio Blue series of notebook hard drives. On January 27, 2009, Western Digital shipped the first 2 TB internal hard disk drive. On March 30, 2009, WD entered the solid-state drive market with the acquisition of Siliconsystems, Inc.
On July 27, 2009, Western Digital announced the first 1 TB mobile hard disk drive, which shipped as both a Passport series portable USB drive as well as a Scorpio Blue series notebook drive. In March 2011, Western Digital has agreed to acquire the global storage unit of Hitachi, Hitachi Global Storage Technologies, for about $4.3 billion which $3.5 billion pay in cash and the rest with 25 million shares of Western Digital. On October 21, 2011, Western Digital's Thailand Plant suspended operation in relation to the 2011 Thailand floods. This has caused a shortage of Hard Drives supplied by Western Digital, and there may be restrictions on production from Seagate. PC manufacturers have been taking note of the issue with Apple CEO, Tim Cook stating that he was expecting an "an overall industry shortage of disk drives". A Dell spokesperson also stated that they were onto the issue and they were "working with our hard drive suppliers to address potential impact for the remainder of the year.